Sunrise Door Solutions supplies the tri-state area with Hollow Metal Doors which are recognized as the leading door in durability and security. Hollow Metal Doors are fire resistant, fully insulated, and withhold strength that makes their performance superior. 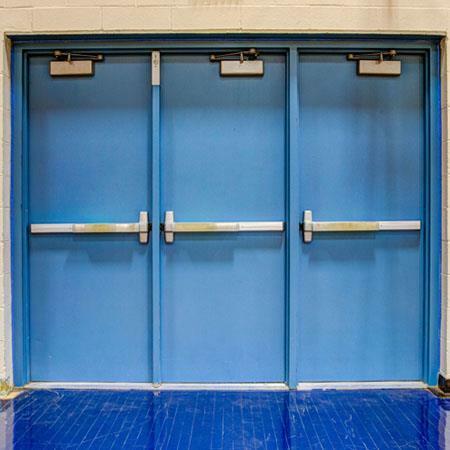 Hollow Metal Doors are often used when additional safety is required, for they resist most environmental conditions and exhibit no complications such as distorting and delamination. Hollow Metal Doors are able to aid in the prevention of loss of life and property damage. These doors can be customized to fit any opening and are available in a variety of standard sizes. Due to their durability, repairs and maintenance are virtually minimal and their lifespan is longer than other leading doors. Sunrise’s Hollow Metal Doors are a perfect solution for institutions such as courthouses, schools, detention centers, prisons, hospitals and other commercial buildings.